The following definitions define key words used in these terms and conditions: WE/US/OUR/COMPANY is Hawknet Computing Ltd, YOU is the end user, WEBSITE is the website or websites owned and used by Hawknet Computing Ltd, SERVICES is the server(s) and software running on said server(s) offering connections to you, OTHER CONTENT is publically downloadable content from our services, REGULAR consists of a period of time no longer than two days while using our services or servers, MONITOR is a process of manual or automatic searching for keywords. You must not use our website or services in any way that causes, or may cause, damage to the website or services, defamation to the company, harrasment to other users of the website or service, or impairment of the availability or accessibility of the website or service; or in any way which is unlawful, illegal, fraudulent or harmful, or in connection with any unlawful, illegal, fraudulent or harmful purpose or activity. By using our website or services to host your own content, you agree that your content is assigned a usage allowence in terms of your content. If your content is found to exceede these quotas your content will be truncated or halted until the quotas are met. In these terms and conditions, ï¿½your user contentï¿½ means material (including without limitation creations, text, images, audio material, video material and audio-visual material) that you submit to our website or services, for whatever purpose. We hold every right to host our own competitions within our services and/or websites. Competition rules must be adheared to. These rules are posted with the competition details. Competition close dates are declared in the competiton however can be closed before this date for any reason decided by us, however when this happens, an announcement will be made on the competiton page. Here is a list of the plugins we use at Hawknet, to manage the server, community, and make the server feature rich. By joining this server, you automatically agree to the Terms and Conditions stated above. Our server is listed on various voting websites. We would highly appreciate you casting a vote for our server if you enjoy your time here. The websites are listed below. We offer various rewards for voting for us. Each vote will net you $200 of ingame currency, and 2 Levels of experience points. and a 1% chance to gain a whopping $10,000 and 30 Levels! The quickest way to connect is by downloading and installing the 1.11.2 version of Minecraft, and then selecting Multiplayer. From there, you can then add a server, and supply a name, like "Hawknet SMP" then for the IP textbox, type: hawkserv.co.uk. It's as easy as that. You can download Feed The Beast from this link. Grab the latest Launcher and start it up. Go to 'Installing the Mod Pack' after reading our Terms and Conditions. 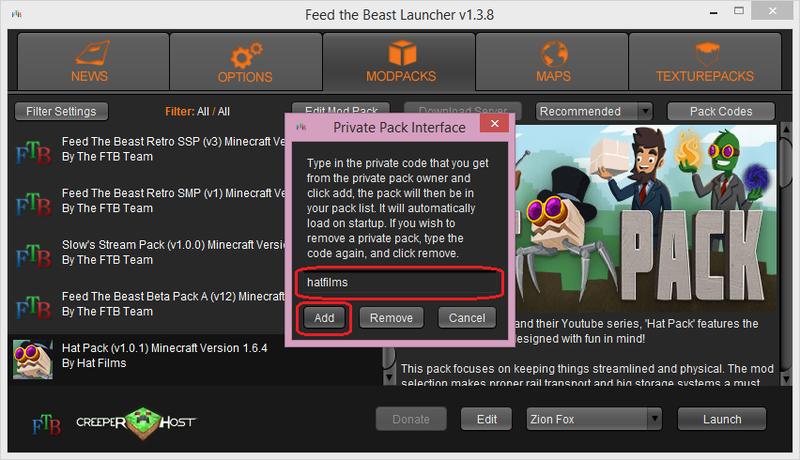 Our Feed The Beast Server has a few mods and recommended Texture Packs available for download should the need arise for it. The texture pack is offered by the server as an option, but due to its size, it may not correctly install. In addition, the texture pack is a 128x128 pack, meaning that it may take some time for the change to happen, and is not recommended to use on low end computers. We also provide two other versions of the pack, at 64px and 32px. Both offer higher quality graphics, but at cost of performance. The mods listed below are required to join the game. 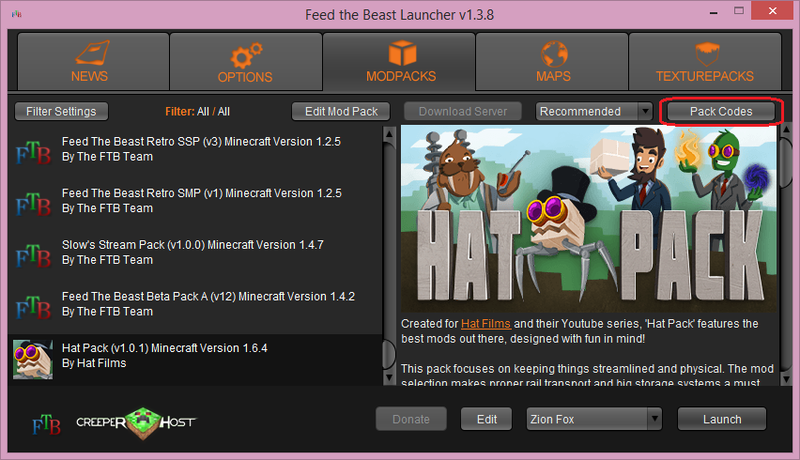 The following steps and images are here to help you installing the HatPack, which is the mod pack we use on our server. First, we are going to start by downloading and installing the client from the 'About and Download' page above. From there, we are going to run the Launcher, and select the Pack Codes button on the top right. The launcher should look like something pictured below. Next, we are going to type into the box hatfilms, and hit the Add button. This should add the pack to the bottom of the list. Next, we need to increase the amount of RAM this pack can take. FTB mods require a lot more RAM than standard Minecraft. 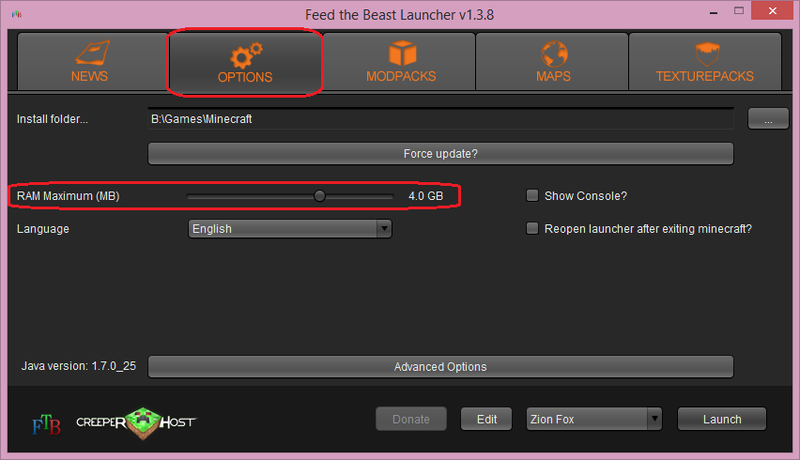 We can alter the amount of RAM that FTB can use in the Options tab at the top, and then moving the slider circled in Red. A good amount of RAM for FTB to use is 2-4GB. It shouldn't need any more than 4GB. Don't forget to leave some for your other programs too. Browsers, music, chat programs and even your operating system all use RAM too. You've activated the pack and increased your RAM, good work! Now we can edit the user profile, and hit Launch in the lower right to start it up. If the game crashes after launch, try increasing your RAM further. Now we can look at getting you Whitelisted on the server. In order to join the whitelist, you need to have played on our Survival Multiplayer server for at least 14 days and earned the rank Builder. Due to the vanilla state of the server, this is a counter measure to prevent major damages or grief to the server. There is a small issue where the server's whitelist needs to be reloaded before you can join. If this page says you are whitelisted, and you cannot connect, please inform an Admin to issue the command "whitelist reload" into Console. I am working on automating this process in the meantime. Input your Minecraft Username into the box below to see if you're eligible. In the same manner as joining our Survival Multiplayer server, we use the same process for joining an FTB server too. Click the Multiplayer button, and then click Add Server. Add the server's name, like Hawknet FTB and then type in the IP: hawkserv.co.uk:25566. The server should appear in the list, and you can join. If you have issues joining the server relating to Whitelist access, make sure you are Whitelisted, and if the problem persists, contact an Admin.